Short Title: Coagulation viewed from Y to cellular biology. 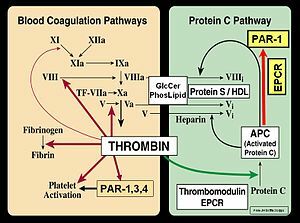 Summary: This portion of the series on PharmaceuticalIntelligence(wordpress.com) isthe first of a three part treatment of the diverse effects on platelets, the coagulation cascade, and protein-membrane interactions. It is highly complex as the distinction between intrinsic and extrinsic pathways become blurred as a result of endothelial shear stress, distinctly different than penetrating or traumatic injury. In addition, other factors that come into play are also considered. The second part will be directed toward low flow states, local and systemic inflammatory disease, oxidative stress, and hematologic disorders, bringing NO and the role of NO synthase in the process. A third part will be focused on management of these states. The activity of guanylate cyclase is altered to a much larger degree than adenylate cyclase, while cyclic nucleotide phosphodiesterase activity remains unchanged. 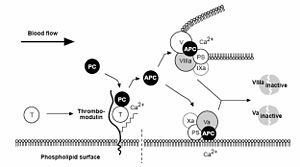 During the early phases of thrombin- and ADP-induced platelet aggregation a marked activation of the guanylate cyclase occurs whereas aggregation induced by arachidonic acid or epinephrine results in a rapid diminution of this activity. In all four cases, the adenylate cyclase activity is only slightly decreased when examined under identical conditions. Platelet aggregation induced by a wide variety of aggregating agents including collagen and platelet isoantibodies results in the “release” of only small amounts (1–3%) of guanylate cyclase and cyclic nucleotide phosphodiesterase and no adenylate cyclase. The guanylate cyclase and cyclic nucleotide phosphodiesterase activities are associated almost entirely with the soluble cytoplasmic fraction of the platelet, while the adenylate cyclase is found exclusively in a membrane bound form. ADP and epinephrine moderately inhibit guanylate and adenylate cyclase in subcellular preparations, while arachidonic and other unsaturated fatty acids moderately stimulate (2–4-fold) the former. Furthermore, these observations suggest a role for unsaturated fatty acids in the control of intracellular cyclic GMP levels. Arachidonic acid, once deemed essential, is a derivative of linoleic acid. (Barbera AJ. Cyclic nucleotides and platelet aggregation effect of aggregating agents on the activity of cyclic nucleotide-metabolizing enzymes. Biochimica et Biophysica Acta (BBA) 1976; 444 (2): 579–595. http://dx.doi.org/10.1016/0304-4165(76)90402-5). The basic principles concerning mechanical stress demonstrated by Robert Hooke (1635-1703) proved to be essential for the understanding of pathophysiological mechanisms in the vascular bed. b) shear stress due to blood flow. The direction of the shear stress vector is determined by the direction of the blood flow velocity vector very close to the vessel wall. Shear stress is applied by the blood against the vessel wall. Friction is the force applied by the wall to the blood and has a direction opposite to the blood flow. The tensions acting against the vessel wall are likely to be determined by blood flow conditions. Shear stresses are most complicated during turbulent flow, regions of flow recirculation or flow separation. The notions of shear rate and fluid viscosity should be first clearly apprehended, since they are crucial for the assessment and development of shear stress. Shear rate is defined as the rate at which adjacent layers of fluid move with respect to each other, usually expressed as reciprocal seconds. The size of the shear rate gives an indication of the shape of the velocity profile for a given situation. The determination of shear stresses on a surface is based on the fundamental assumption of fluid mechanics, according to which the velocity of fluid upon the surface is zero (no-slip condition). Assuming that the blood is an ideal Newtonian fluid with constant viscosity, the flow is steady and laminar and the vessel is straight, cylindrical and inelastic, which is not the case. Under ideal conditions a parabolic velocity profile could be assumed. The blood is considered as a Newtonian fluid. The vessel cross sectional area is cylindrical. The vessel is straight with inelastic walls. The blood flow is steady and laminar. The Haagen-Poisseuille equation indicates that shear stress is directly proportional to blood flow rate and inversely proportional to vessel diameter. Viscosity is a property of a fluid that offers resistance to flow, and it is a measure of the combined effects of adhesion and cohesion. It increases as temperature decreases. Blood viscosity (non-Newtonian fluid) depends on shear rate, which is determined by blood platelets, red cells, etc. Moreover, it is slightly affected by shear rate changes at low levels of hematocrit. In contrast, as hematocrit increases, the effect of shear rate changes on blood viscosity becomes greater. Blood viscosity measurement is required for the accurate calculation of shear stress in veins or microcirculation. It has to be emphasised that the dependence of blood viscosity on hematocrit is more pronounced in the microcirculation than in larger vessels, due to hematocrit variations observed in small vessels (lumen diameter <100 Ìm). The significant change of hematocrit in relation to vessel diameter is associated with the tendencyof red blood cells to travel closer to the centre of the vessels. Thus, the greater the decrease in vessel lumen, the smaller the number of red blood cells that pass through, resulting in a decrease in blood viscosity. Endothelium responds to shear stress through various pathophysiological mechanisms depending on the kind and the magnitude of shear stresses. More specifically, the exposure of vascular endothelium to shear forces in the normal value range stimulates endothelial cells to release agents with direct or indirect antithrombotic properties, such as prostacyclin, nitric oxide (NO), calcium, thrombomodulin, etc. The possible existence of so-called “mechanoreceptors” has provoked a number of research groups to propose receptors which “translate” mechanical forces into biological signals. Under normal shear conditions, endothelial as well as smooth muscle cells have a rather low rate of proliferation. Changes in shear stress magnitude activate cellular proliferation mechanisms as well as vascular remodeling processes. More specifically, a high grade of shear stress increases wall thickness and expands the vessel’s diameter, so that shear stress values return to their normal values. In contrast, low shear stress induces a reduction in vessel diameter. Shear stresses stimulate vasoregulatory mechanisms which, together with alterations of arterial diameter, serves to maintain a mean shear stress level of about 15 dynes/cm2. The presence of low shear stresses is frequently accompanied by unstable flow conditions (e.g. turbulence flow, regions of blood recirculation, “stagnant” blood areas). Leukocyte adhesion under flow in the microvasculature is mediated by binding between cell surface receptors and complementary ligands expressed on the surface of the endothelium. Leukocytes adhere to endothelium in a two-step mechanism: rolling (primarily mediated by selectins) followed by firm adhesion (primarily mediated by integrins). These investigators simulated the adhesion of a cell to a surface in flow, and elucidated the relationship between receptor–ligand functional properties and the dynamics of adhesion using a computational method called ‘‘Adhesive Dynamics.’’ This relationship was expressed in a one-to-one map between the biophysical properties of adhesion molecules and various adhesive behaviors. Behaviors that are observed in simulations include firm adhesion, transient adhesion (rolling), and no adhesion. They varied the dissociative properties, association rate, bond elasticity, and shear rate and found that the unstressed dissociation rate, kro, and the bond interaction length, γ, are the most important molecular properties controlling the dynamics of adhesion. The study of the effect of leukocyte adhesion on blood flow in small vessels is of primary interest to understand the resistance changes in venular microcirculation when blood is considered as a homogeneous Newtonian fluid. When studying the effect of leukocyte adhesion on the non-Newtonian Casson fluid flow of blood in small venules; the Casson model represents the effect of red blood cell aggregation. In this model the blood vessel is considered as a circular cylinder and the leukocyte is considered as a truncated spherical protrusion in the inner side of the blood vessel. Numerical simulations demonstrated that for a Casson fluid with hematocrit of 0.4 and flow rate Q = 0:072 nl/s, a single leukocyte increases flow resistance by 5% in a 32 m diameter and 100 m long vessel. For a smaller vessel of 18 m, the flow resistance increases by 15%. Biologists have identified many of the molecular constituents that mediate adhesive interactions between white blood cells, the cell layer that lines blood vessels, blood components, and foreign bodies. However, the mechanics of how blood cells interact with one another and with biological or synthetic surfaces is quite complex: owing to the deformability of cells, the variation in vessel geometry, and the large number of competing chemistries present (Lipowski et al., 1991, 1996). Adhesive interactions between white blood cells and the interior surface of the blood vessels they contact is important in inflammation and in the progression of heart disease. Parallel-plate microchannels have been useful in characterizing the strength of these interactions, in conditions that are much simplified over the complex environment these cells experience in the body. Recent computational and experimental work by several laboratories have attempted to bridge this gap between behavior observed in flow chamber experiments, and cell surface interactions observed in the microvessels of anesthetized animals. We have developed a computational simulation of specific adhesive interactions between cells and surfaces under flow. In the adhesive dynamics formulation, adhesion molecules are modeled as compliant springs. One well-known model used to describe the kinetics of single biomolecular bond failure is due to Bell, which relates the rate of dissociation kr to the magnitude of the force on the bond F. The rate of formation directly follows from the Boltzmann distribution for affinity. The expression for the binding rate must also incorporate the effect of the relative motion of the two surfaces. Unless firmly adhered to a surface, white blood cells can be effectively modeled as rigid spherical particles, as evidenced by the good agreement between bead versus cell in vitro experiments (Chang and Hammer, 2000). Various in vitro, in vivo, and computational methods have been developed to understand the complex range of transient interactions between cells, neighboring cells, and bounding surfaces under flow. Knowledge gained from studying physiologically realistic flow systems may prove useful in microfluidic applications where the transport of blood cells and solubilized, bioactive molecules is needed, or in miniaturized diagnostic devices where cell mechanics or binding affinities can be correlated with clinical pathologies. (King MR. Cell-Surface Adhesive Interactions in Microchannels and Microvessels. First International Conference on Microchannels and Minichannels. 2003, Rochester, NY. Pp 1-6. ICMM2003-1012. Vascular occlusion is responsible for much of the morbidity associated with sickle cell disease. Although the underlying cause of sickle cell disease is a single nucleotide mutation that directs the production of an easily polymerized hemoglobin protein, both the erythrocyte sickling caused by hemoglobin polymerization and the interactions between a proadhesive population of sickle cells and the vascular endothelium are essential to vascular occlusion. Interactions between sickle cells and the endothelium use several cell adhesion molecules. Sickle red cells express adhesion molecules including integrin, CD36, band 3 protein, sulfated glycolipid, Lutheran protein, phosphatidylserine, and integrin-associated protein. The proadhesive sickle cells may bind to endothelial cell P-selectin, E-selectin, vascular cell adhesion molecule-1 (VCAM-1), CD36, and integrins. Activation of endothelial cells by specific agonists enhances adhesion by inducing the expression of cellular adhesion molecules and by causing cell contraction, which exposes extracellular matrix proteins, such as thrombospondin (TSP), laminin, and fibronectin. Initial events likely involve the adhesion of sickle erythrocytes to activated endothelial cells under laminar flow. The resultant adhesion of cells to the vascular wall creates nonlaminar and arrested flow, which propagates vascular occlusion by both static and flow adhesion mechanisms. It is likely too that the distinct mechanisms of adhesion and of regulation of endothelial cell adhesivity pertain under dissimilar types of flow. We have also reported that sickle cell adhesion to endothelial cells under static conditions involves P-selectin. Although P-selectin plays a major role in the tethering, rolling, and firm adhesion of leukocytes to activated endothelial cells, its contribution to the initial steps is singular and essential to the overall adhesion process. Upon stimulation of endothelial cells by thrombin, P-selectin rapidly translocates from Weibel-Palade bodies to the luminal surface of the cells. Others have shown that sickle cell adhesion is decreased by unfractionated heparin, but the molecular target of this inhibition has not been defined. We postulated that the adhesion of sickle cells to P-selectin might be the pathway blocked by unfractionated heparin. Heparin is known to block certain types of tumor cell adherence, TSP-independent sickle cell adherence, and coagulation processes that are active in sickle cell disease. In one uncontrolled study, prophylactic administration of heparin reduced the frequency of sickle cell pain crises. The role of P-selectin in the endothelial adhesion of sickle red blood cells, the capacity of heparin to block selected P-selectin–mediated adhesive events, and the effect of heparin on sickle cell adhesion suggest an association among these findings. We postulate that, in a manner similar to that seen for neutrophil adhesion, P-selectin may play a role in the tethering and rolling adhesion of sickle cells. As with neutrophils, integrins may then mediate the firm adhesion of rolling sickle erythrocytes. The integrin is expressed on sickle reticulocytes and can mediate adhesion to endothelial cells, possibly via endothelial VCAM-4. The endothelial integrin, V3, also mediates sickle cell adhesion to endothelial cells. Other 1 and 3 integrins may also fulfill this role. In this report we demonstrate that the flow adherence of sickle cells to thrombin-treated human vascular endothelial cells also uses P-selectin and that this component of adhesion is inhibited by unfractionated heparin. We also demonstrate that sickle cells adhere to immobilized recombinant P-selectin under flow conditions. This adhesion too was inhibited by unfractionated heparin, in a concentration range that is clinically attainable. These findings and the general role of P-selectin in initiating adhesion of blood cells to the endothelium suggest that unfractionated heparin may be useful in preventing painful vascular occlusion. A clinical trial to test this hypothesis is indicated. MacFarlane RG (1964). “An enzyme cascade in the blood clotting mechanism, and its function as a biochemical amplifier”. Nature 202 (4931): 498–9. doi:10.1038/202498a0. PMID 14167839. 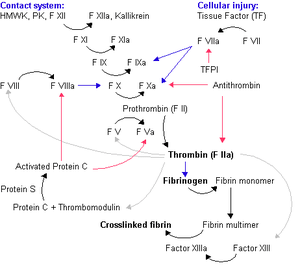 David Lillicrap; Nigel Key; Michael Makris; Denise O’Shaughnessy (2009).Practical Hemostasis and Thrombosis. Wiley-Blackwell. pp. 1–5. ISBN 1-4051-8460-4. Alan D. Michelson (26 October 2006). Platelets. Academic Press. pp. 3–5. ISBN 978-0-12-369367-9. Retrieved 18 October 2012. Furie B, Furie BC (2005). “Thrombus formation in vivo”. J. Clin. Invest.115 (12): 3355–62. doi:10.1172/JCI26987. PMC 1297262.PMID 16322780.